With an undergraduate enrollment around 1,400 students, there is not much on the Marietta College campus that goes unnoticed. It could be assumed that all groups get publicized similarly; however that is not that case for one organization. The Marietta menâ€™s and womenâ€™s tennis teams compete every year in a rugged Ohio Athletic Conference, yet rarely are thought of when it comes to athletics on campus. 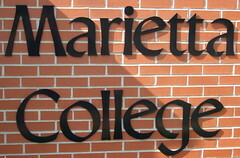 â€œTo be honest, I didnâ€™t even know we had tennis teams here,â€ said Marietta College sophomore John Lucore. Almost everyone is familiar with everything from College Union Board activities to the employees at Gilman, so why is a varsity sport on the low spot on the totem pole? â€œI think it comes down to people not really being sure how the sport works, and people arenâ€™t going to come watch something that confuses them,â€ said Marietta College sophomore and menâ€™s tennis member Josh Patterson. For each match six players from each team play an individual singles contest as well as three double matches. The winner of each is awarded a point, and the team with the most points out of nine is declared the winner. Confusion of how exactly to watch the game also comes into consideration for a lack of attention for the teams. â€œI think people are unsure when to applaud. Itâ€™s more like golf, you clap after a point, not during the action. Youâ€™re not going to bring a cowbell or anything like to that watch a match,â€ said Patterson. Uncertainty of the game at times has led to sparse turnouts for home contests for the Pioneers. â€œI think our biggest fans could very well be the trainers,â€ said Patterson jokingly. The low turnout though has not stopped the team from competing. During the off-season the two teams practice at a local indoor club with a former collegiate stand-out who offers lessons. Once the season rolls around, the team is on the court six days a week, sometimes more than once a day. 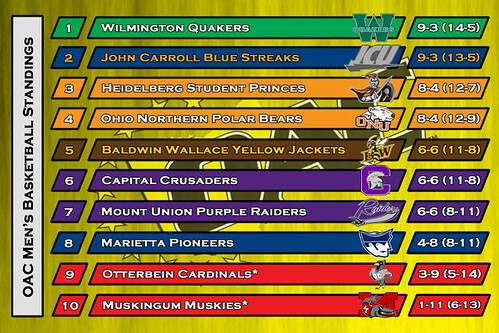 With the OAC season fast approaching, the two teams have been on the court non-stop preparing for the thick of the schedule. The teams call the Beren Tennis Center home for their home matches. The Center, which opened in 2002, is a top notch-facility that is not only open to the team, but faculty and students as well. EDITOR’S NOTE: Â This article is by Chris Miller, a Media Writing Two student at Marietta College. Â If you are interested in writing for Writing on the Mall, send an e-mail to Patrick_H@writingonthemall.net.